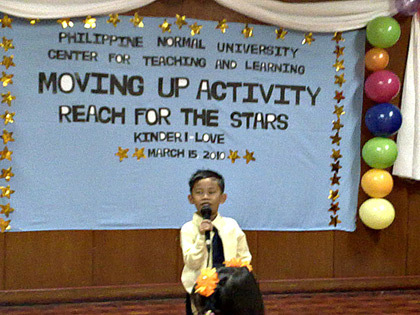 Sean ‘graduated’ from Kinder 1 in PNU CTL last March 15, and he is moving up to Kinder 2 in the coming school year. 🙂 They had a small program at the school auditorium. What I like about their moving up program is that all of the kids participated. Each child were given the opportunity to have a role. Emcee, Opening Prayer, Opening and Closing Remarks. 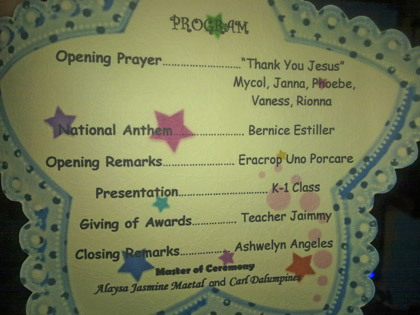 Speeches were written by their teacher, Teacher Jaimmy Griffins. Other kids (including Sean) danced to the tune of “What Dreams Are Made Of“, while others sang “Reach for the Stars“. Teacher Jaimmy gave out awards to each child like Best in Academics, Best in Reading, Best in Science, Best in Writing, Most Punctual, Most Friendly, Most Active, etc. On one of the last parts of the program, the kids sang “Thank You” and gave out roses to their parents. I was so teary eyed! Didn’t see anyone with dry eyes anyway, hehe! At the end of the program Teacher thanked the parents for entrusting the children to her. There were no Top Ten in the class and that’s because they do not give number grades. 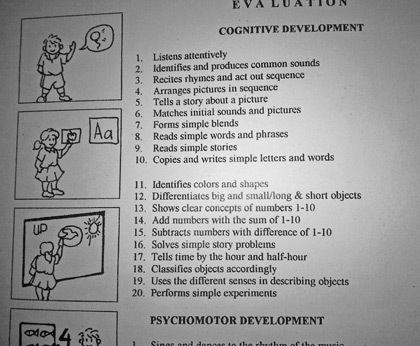 The children were evaluated based on narrative reports or a checklist. Real number grades starts in Grade 1. I personally like this approach since I find it more specific. Like for example, Sean could have 98 or 100 in his tests but his “Listens attentively” evaluation had I for Improving on the First Quarter. At the end of the school year, it was already VS – Very Satisfactory. Although he got O – Outstanding in “Adds Numbers with the sum of 1-10” he got VS in “Subtracts numbers with the difference of 1-10“. Haha! that’s because he either play first or play while doing seat work. At one time, he was the last one to go out of the room coz he’s not finished yet. I was waiting outside and wondering what’s taking him so long when almost all of his classmates were already outside. Thanks sis. hehehe, basta Sean diba? *wink* Apir! Thanks Codewalkz. Good to know you&apos;re okay. Congrats, Sean! 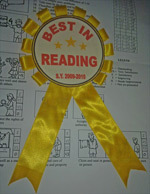 wow, Best in Reading! Galing naman…Ok talaga sistema sa PNU. Last week nga nag-preschool hunting kami coz we&apos;re transferring Greggy to another school this year. Napaka-tamad ng teacher nya e. Sakit sa ulo. Thanks, may nakita na kayong school? Ganun? Kainis nga yung ganun lalo pa at private, hay naku, sayang bayad. Congrats sa son mo. Ang galing niya. I would not be surprised if Sean got the Best in Reading Award. I have seen the video you posted when he was reading. Magaling talaga siya. Congratulations, Sean! Thanks friend. 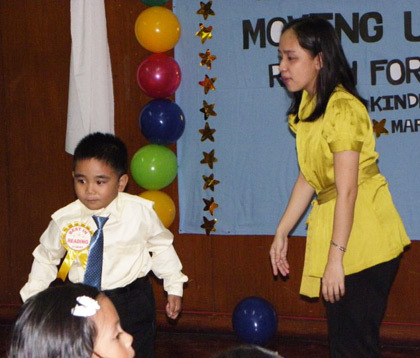 I wasn&apos;t expecting that award coz Carl is really good in reading too, excels in all subjects plus masyadong bibo pa. He got the Best in Academics naman. Sayang nga walang honor list, kasi for sure Carl will be on top. He&apos;s been to Kinder 1 in a private school pero he wasn&apos;t accepted sa Kinder 2 in PNU last year kasi hindi tumatanggap ng transferee dun, you really have to start in Kinder 1 at kailangan nasa age bracket na 4-5. 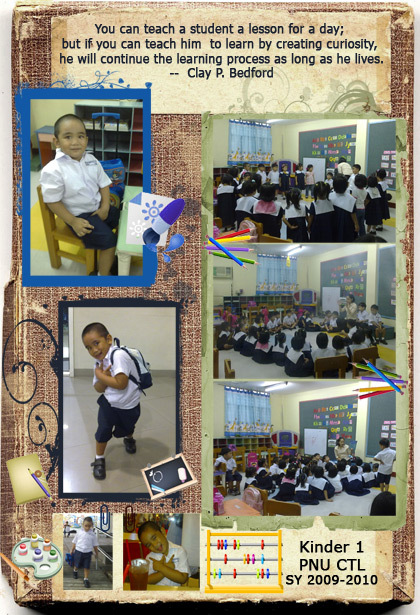 Since tama lang naman sa age nya coz he turned 5 last August kaya nag enroll na rin sila sa Kinder 1. O ayan, nag tsismis pa pala ako hehe. Now ko lang yata narinig si Piaget, pero semi-close ko na si Freud kasi familiar na yung name nya nabasa ko na somewhere before haha. That&apos;s interesting ha, buti na lang may internet mabilis mag search hehe. Ate Amor, Congrats sa inyo ni Sean. Paglaki nya podcasting ang forte kesa blogging, hehehe. 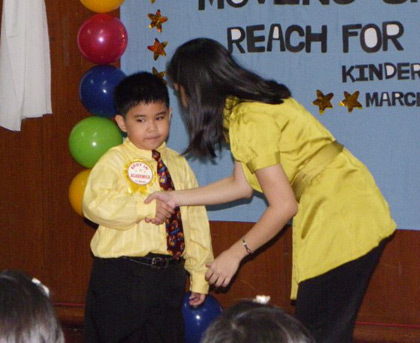 Btw, yan ba yung teacher ni Sean na di mo nakunan ng pic noon? 😛 Ambata pa pala.